1. Preheat the grill to high and cover a large baking sheet with foil. 2. Toss the tomatoes, balsamic glaze, olive oil and red onion together in a bowl and set aside. 3. 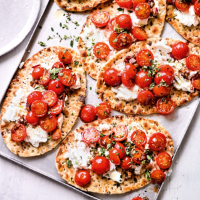 Place the flatbreads unfolded onto the baking sheet. Divide the ricotta between them, spread over the top then season. Top with the balsamic tomato mixture and grill for 5-7 minutes. 4. Remove and leave to cool slightly. Top with fresh lemon thyme, slice into triangles and serve.